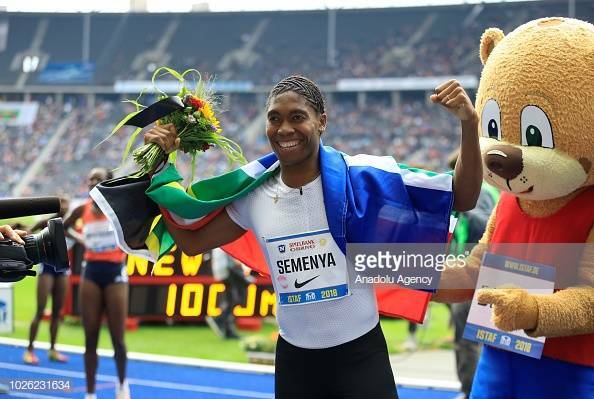 Just three days after claiming the IAAF Diamond League title in Zurich, Caster Semenya was most certainly not done! Swopping Switzerland for Germany, the middle-distance sensation shattered her own South African 1,000m record at the IAAF World Challenge meeting in Berlin. Her earlier mark of 2min 31.01sec had been set in Rabat, Morocco two months ago. There was no slacking off from Semenya after she’d won her third straight Diamond League title on Thursday night. At the ISTAF meeting, 45,000 spectators roared her on to a solo-paced time of 2:30.70, taking 0.31sec of her old time. It’s the fifth fastest of all time and a world-leading time this year. World best is the 2:28.98 run 22 years ago by Russian Svetlana Masterkova. Semenya shook off a false start and went through 400m in 59.51 seconds and was on schedule to go close to the African mark of 2:29.34 held my former mentor Maria Mutola of Mozambique and set a year before the current world record. But with no pace-maker to help her on, she slowed somewhat, despite an impressive time of 2min 01.07sec at the 800m, her best distance.